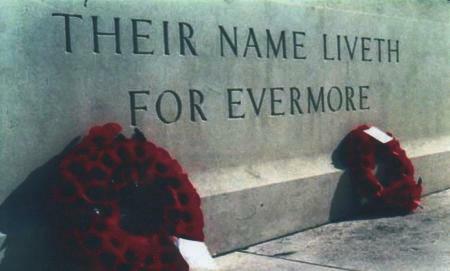 Home » Village History » Rothley War Memorial » KIRK J. Killed in action in the France and Flanders Campaign on the 11th April 1917 aged 28 years. He lived on Cross Green, Rothley with his wife Sarah Jane Kirk and daughters Win and Gladys. Born in Oadby, son of Thomas and Mary A. Kirk and brother to Tom, Fred, Ellen and Clara. On the 9th April Battalion HQ moved up to the sunken road in T.22.a.20.35, ? 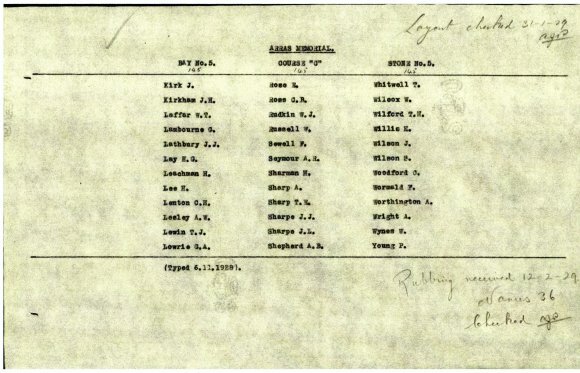 then "A" Company from reserve relieved "D" Company in the front line as a consequence of heavy casualties suffered by "D" Company who had lost 4 officers and 15 other ranks on the night of the 10th/11th April from enemy shell fire. 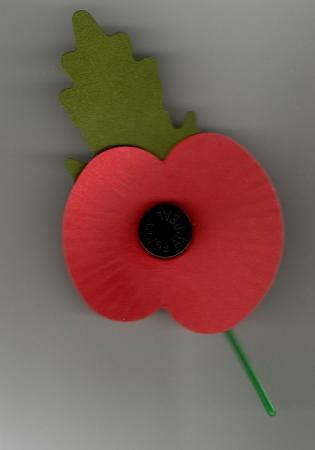 2nd Lt W.H.BENNETT was killed and 2nd Lt's MESNY, DOUGLAS and UNDERWOOD (died of wounds 16th April) being wounded. On the morning of the 12th April "D" Company under Major T.L.WARNER carried out a minor enterprise in conjunction with the 6th LEICESTERSHIRE REGT and the 64th Infantry Brigade. The operation was to bomb down the HINDENBURG TRENCH and take up a line close to and on three sides to FONTAINE-LES-CROISILLES. "D" Company continued the line of attack on the right of the 6th LEICESTERSHIRE REGT, who were to keep in touch with the line of the attack of the 64th Infantry Brigade, but were to remain outside the wire of the HINDENBURG LINE. The operations were held up, very early in the day owing to the failure in supply of bombs. 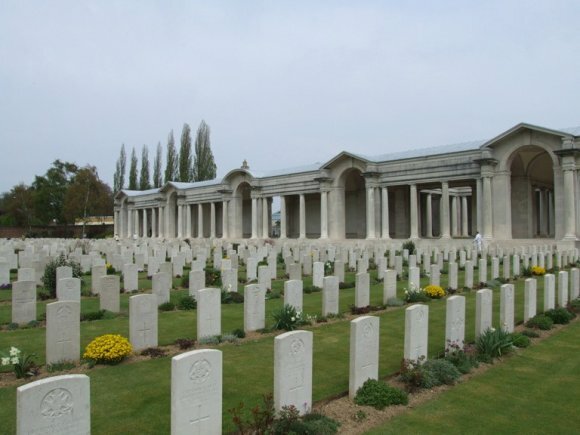 Major WARNER using every bit of cover afforded by the folds in the ground remained with "D" Company out in the open until midnight 12th/13th April, during which time the Company suffered casualties to 20 other ranks, 8 being killed. The same night the Battalion was relieved by the 7th LEICESTERSHIRE REGT. Bivouacked in MOYENVILLE whence it marched to ADINFER and bivouacked on the 14th April. 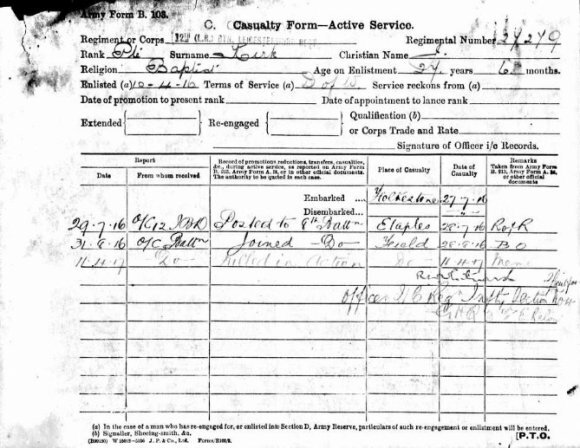 The Official Casualty Record for Private Kirk showing 'Killed in Action' in the field. Joe Kirk and Sarah Jane Memory were married in Leicester in the third quarter of 1911. Winifred was born a year later in Leicester, with Gladys coming along in 1915 when the family home was on Cross Green in Rothley. 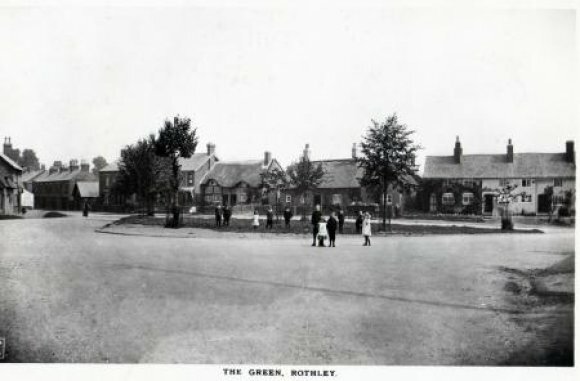 This postcard shows Rothley Cross Green as it would have looked then.